Introducing ~ Los Tres Girasoles! 20% of the profits from the bilingual The Three Sunflowers ~ Los Tres Girasoles are lovingly donated to non-profits who provide immigration advocacy and legal support. 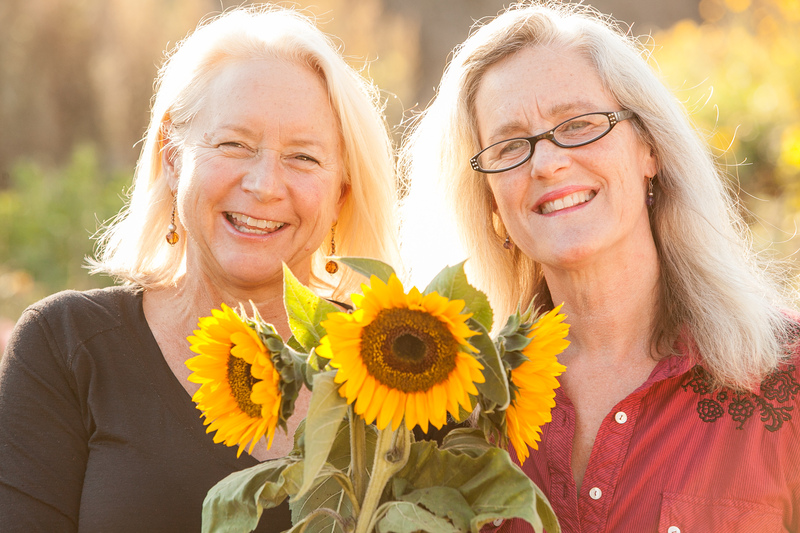 click here for Los Tres Girasoles endorsements in English and Spanish. The Three Sunflowers is really well written and insightful. Glad I found your website, warm regards from Mariko! The Three Sunflowers tells of a turbulent day in the garden where a trio of sunflowers — the tall, wise Gloria and young Florecita and Solecito — face unexpected and chaotic events they have no power to prevent. 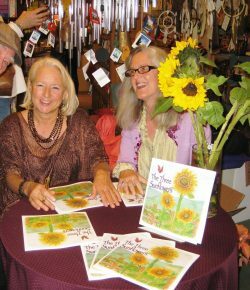 Through it all, Gloria guides and reassures the youngsters and reminds them of the nature and purpose of a sunflower’s life, “We are sunflowers, golden and radiant. Our job is to be loving and peaceful wherever we stand.” After a dark night of uncertainty, the story concludes with a delightful and inspiring ending. This beautifully written and illustrated book offers comforting messages of hope, compassion, love and peace, with new perspectives for living in an unpredictable world. Janet Lucy, MA, is an award-winning writer and poet, and author of Moon Mother, Moon Daughter – Myths and Rituals that Celebrate a Girl’s Coming of Age. Janet is the Director of Women’s Creative Network in Santa Barbara, California, where she is a teacher, counselor/consultant, facilitates women’s writing groups and leads international retreats. She has lived in Mexico, Costa Rica and Italy, connecting with the Divine Feminine in all her glorious guises and cultural richness. Janet is the mother of two radiant daughters. Colleen McCarthy-Evans is an award-winning watercolorist, writer and board game inventor, as well as a passionate fiber artist. She’s a co-founder of the Santa Barbara Charter School, which teaches conflict resolution along with academics and the arts. She lives in Santa Barbara, California with her husband and dog, and enjoys being in and out of the garden with her two grown sons. Her lifelong love of Latin culture has taken her on many adventures in Mexico, Beliz, Guatemala, Costa Rica, Spain and Peru.